This Labradorite weighs over 28.5 Lbs. It stands 10 1/4 inches and measures 11 x 5 inches across. Shipping in the continental USA has been included in price. This Labradorite weighs over 8.5 Lbs. It stands 7 3/4 inches and measures 5 x 3 inches across. Shipping in the continental USA has been included in price. This Labradorite weighs over 23 Lbs. It stands 9 1/2 inches and measures 9 x 4 3/4 inches across. Shipping in the continental USA has been included in price. This Labradorite weighs over 6.5 Lbs. It stands 6 inches and measures 7 x 2 inches across. Shipping in the continental USA has been included in price. This Labradorite weighs over 17 Lbs. It measures 8 inches tall and 9 x 3 1/2 inches across. This item ships free anywhere in the continental USA. This small piece of Labradorite measures 1 5/8 x 1 5/8 inches. Stand not included. Labradorite is known for its beautiful blue and opalescent flashes or sparkles. This item ships free anywhere in the continental USA. This small piece of Labradorite measures 2 5/8 x 1 1/2 inches. Stand not included. Labradorite is known for its beautiful blue and opalescent flashes or sparkles. This item ships free anywhere in the continental USA. This small piece of Labradorite measures 2 3/4 x 1 5/8 inches. Stand not included. Labradorite is known for its beautiful blue and opalescent flashes or sparkles. This item ships free anywhere in the continental USA. This small piece of Labradorite measures 2 x 1 1/4 inches. Stand not included. Labradorite is known for its beautiful blue and opalescent flashes or sparkles. This item ships free anywhere in the continental USA. This small piece of Labradorite measures 3 x 2 1/4 inches. Stand not included. Labradorite is known for its beautiful blue and opalescent flashes or sparkles. This item ships free anywhere in the continental USA. This small piece of Labradorite measures 2 1/2 x 2 1/8 inches. Stand not included. Labradorite is known for its beautiful blue and opalescent flashes or sparkles. This item ships free anywhere in the continental USA. This small piece of Labradorite measures 2 1/2 x 2 inches. Stand not included. Labradorite is known for its beautiful blue and opalescent flashes or sparkles. This item ships free anywhere in the continental USA. This small piece of Labradorite measures 2 1/2 x 2 1/4 inches. Stand not included. Labradorite is known for its beautiful blue and opalescent flashes or sparkles. This item ships free anywhere in the continental USA. This small piece of Labradorite measures 4 x 1 3/4 inches. Stand not included. Labradorite is known for its beautiful blue and opalescent flashes or sparkles. This item ships free anywhere in the continental USA. This small piece of Labradorite measures 2 3/4 X 1 3/4 inches. Stand not included. Labradorite is known for its beautiful blue and opalescent flashes or sparkles. This item ships free anywhere in the continental USA. This small piece of Labradorite measures 3 x 1 1/2 inches. Stand not included. Labradorite is known for its beautiful blue and opalescent flashes or sparkles. This item ships free anywhere in the continental USA. This small piece of Labradorite measures 2 1/4 x 1 1/2 inches. Stand not included. Labradorite is known for its beautiful blue and opalescent flashes or sparkles. This item ships free anywhere in the continental USA. This small piece of Labradorite measures 1 5/8 x 1 1/2 inches. Stand not included. 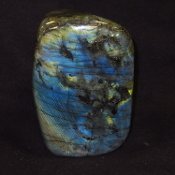 Labradorite is known for its beautiful blue and opalescent flashes or sparkles. This item ships free anywhere in the continental USA. This small piece of Labradorite measures 2 x 2 inches. Stand not included. Labradorite is known for its beautiful blue and opalescent flashes or sparkles. This item ships free anywhere in the continental USA. This small piece of Labradorite measures 2 3/4 x 1 1/2 inches. Stand not included. Labradorite is known for its beautiful blue and opalescent flashes or sparkles. This item ships free anywhere in the continental USA. This small piece of Labradorite measures 2 1/2 x 1 1/2 inches. Stand not included. Labradorite is known for its beautiful blue and opalescent flashes or sparkles. This item ships free anywhere in the continental USA. This small piece of Labradorite measures 3 x 1 inches. Stand not included. Labradorite is known for its beautiful blue and opalescent flashes or sparkles. This item ships free anywhere in the continental USA. This small piece of Labradorite measures 3 x 2 inches. Stand not included. Labradorite is known for its beautiful blue and opalescent flashes or sparkles. This item ships free anywhere in the continental USA. This small piece of Labradorite measures 2 x 1 1/2 inches. Stand not included. Labradorite is known for its beautiful blue and opalescent flashes or sparkles. This item ships free anywhere in the continental USA. This small piece of Labradorite measures 3 1/4 x 2 5/8 inches. Stand not included. Labradorite is known for its beautiful blue and opalescent flashes or sparkles. This item ships free anywhere in the continental USA. This small piece of Labradorite measures 1 3/4 x 1 1/4 inches. Stand not included. Labradorite is known for its beautiful blue and opalescent flashes or sparkles. This item ships free anywhere in the continental USA.